I wanted to get an idea of what words are most associated with mindfulness at the moment. I copied the information that came up in the first three pages of google hits when I typed in ‘what is mindfulness?’ I pasted that information into wordle and it gave me the following word cloud. 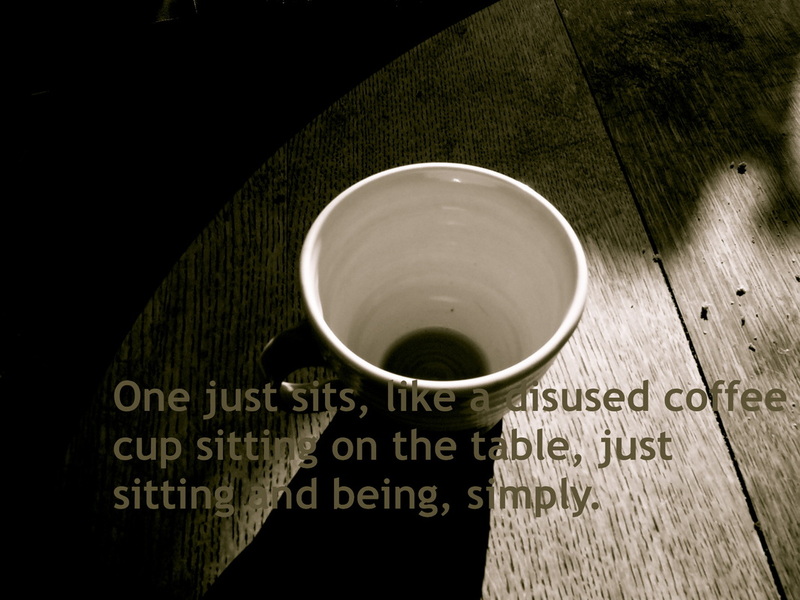 Sitting like a coffee cup may sound weird (or even insulting) but the image conveyed in this can feel inviting too: we make very few expectations and demands on a disused coffee cup, far removed from the spiders web of constant demands and expectations we often feel caught in. But when we take a few minutes to simply sit, (or lie on the floor, or take a short walk), breathe and gently pay attention to the present moment - in that moment at least we can let go of the pressure of expectation and demand. If this description of mindfulness still feels elusive - why not skip to 'the practice page' on the website, which has some short mindfulness practice suggestions. Rather like trying to understand conceptually what water tastes like, it might be easier to drink some.